Needle-punched Synthetic fiber construction prevents decomposition and shredding, minimizing mildew and odors even if damp. 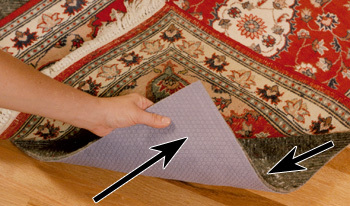 This pad protects any oriental or other area rug laid over any hard floor - wood, tile, stone, brick, terrazzo, laminate, etc.- including highly waxed and polished surfaces. 100% synthetic, chemically inert padding contains NO plant or animal fibers to decompose, outgas, or aggravate allergies. Thermal-set ridges on the upper surface, in an exclusive pattern of chevrons, running in multiple directions, enables the pad to grip the rug more effectively and prevents lateral motion in ANY direction. Superior natural latex rubber formulation in a new, exclusive hexagonal "tire tread" pattern, plus more real rubber in actual contact with any bare floor, no matter how slippery, and provides the highest degree of non-slip traction. 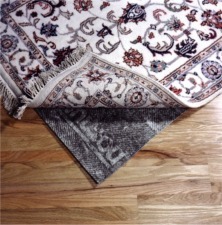 "Compare DuraHoldPlus™ with any other rug pad...try to pull them apart...you'll see why DuraHoldPlus™ is best!"